C.P. Shilton was a versatile painter and minor illustrator of periodicals and children’s books, able to work in a variety of styles and subjects. He was born on 19 March 1887, and baptized on 12 July 1887 at St Margaret’s Church, Stoke Golding, Leicestershire (it is sometimes erroneously referred to as being in Warwickshire, as its post town is Nuneaton). 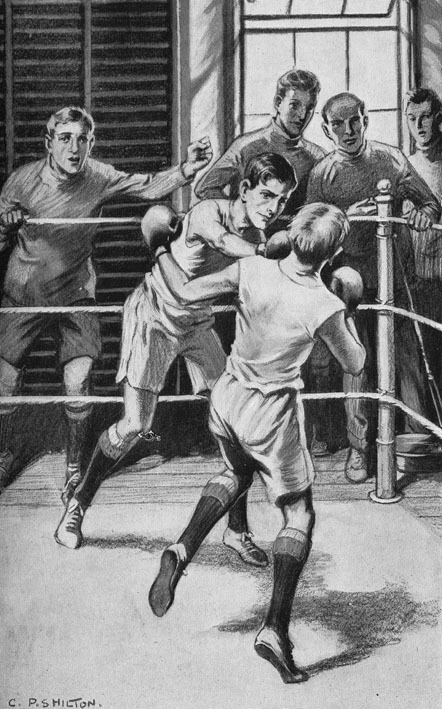 The baptism record gave his name as Claud Percival Shilton Pegg – however, all later records give his first name as Claude (with an “e”). His father was Thomas Shilton Pegg (1861-1953), a grocer and carpenter, who had married Susan Hall (1860-1931) on 25 December 1882 in Stoke Golding. 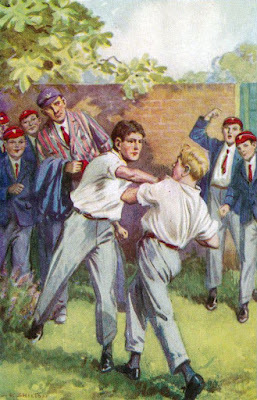 Thomas was the son of another Thomas Shilton, who had married Elizabeth (or Eliza) Pegg in February 1863 – hence the family name of Shilton Pegg, although the Pegg was quickly dropped. Thomas and Susan went on to have three children: Harry (born in Winshill, Derbyshire, in 1883), Hetty Angela (born in Stoke Golding in 1887) and her twin brother Claude (both Hetty and Claude were baptized on the same day). At the time of the 1901 census, the family was still in Stoke Golding, at Dadlington End, with Thomas now working as a grocer, baker and draper, and his son Harry working for him as an apprentice. The family was comparatively comfortably-off, as in both the 1891 and 1901 census records they were shown as having a young female domestic servant (aged 13 and 15 respectively). It is known that Claude Percival Shilton received his artistic training at the Leicester Municipal Technical and Art School (founded as the Leicester School of Art in 1870), although when he studied there is not clear). When he joined the RAF in 1918 his service record gave his occupation as “Artist, Poster Designer and Illustrator”, with his employer as the School of Art, Leicester, between March 1908 and June 1911, and the Westminster School of Art, London, between February 1912 and July 1914. This suggests that he was employed at both establishments, although he could have been there as a student. At the time of the 1911 census Shilton was recorded at 35 Margarette Terrace, Chelsea, working as a commercial designer, and one of three boarders of Beatrice Hitchens. However, he was also recorded in the Leicestershire Electoral Register as a lodger at The Birches, Stoke Golding, having the sole use of an unfurnished bedroom in a property owned by his father. In the meantime, on 18 March 1918 (when he gave his address as being in Hursley, Hampshire) he had married Alice Payne, a teacher (born on 6 October 1887, the daughter of James Payne, a manufacturer) at St. Margaret’s Church, Stoke Golding. After his discharge from the R.A.F. he and his wife moved to 49 Elsham Road, Kensington, while at the same time Shilton was renting a studio at 7 Brook Green Studios, Hammersmith. In 1927, they moved to West Hall Road, Mortlake, Surrey, where he remained for the rest of his life. Whilst he had obviously been working as a professional artist before the First World War, most of his work appears to have been anonymous – as a commercial designer he would presumably have worked on things such as advertisements, posters, packaging etc. 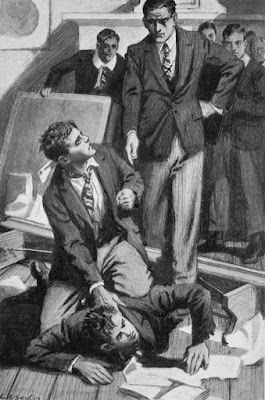 His career as an illustrator appears to have begun in 1914, when he produced the cover for an issue of the story magazine Yes or No, although his next known work did not appear until 1920, when he was one of several artists who contributed to Arthur Mee’s book on England and its history, Little Treasure Island: Her Story and Glory, published by Hodder & Stoughton. In 1922 he designed the dustjacket for an edition of Arthur Conan Doyle’s The Hound of the Baskervilles, published by John Murray. 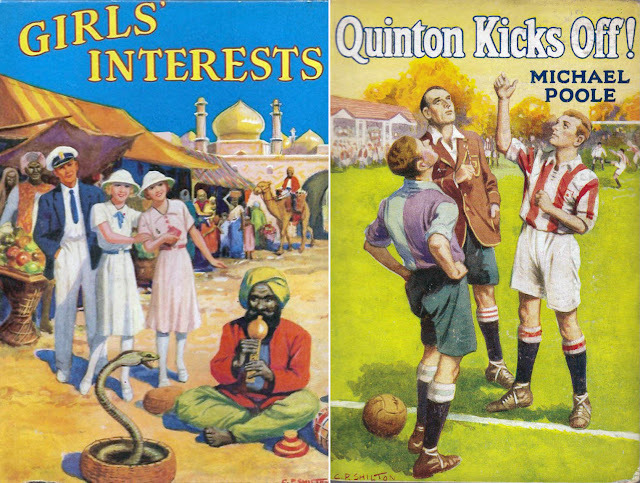 He went on to illustrate a handful of children’s books published by the Religious Tract Society and Cassell & Co., between 1925 and 1931, mainly school and adventure stories, by authors such as Frank H. Shaw, Michael Poole, David Ker, M. Harding Kelly, Rita Coatts, Gunby Hadath and Alfred Judd. He also became a regular contributor to children’s annuals and similar books, with his illustrations appearing in volumes such as Collins’ Schoolgirls’ Annual, The British Girl’s Annual, The Best Book for Girls, Schoolgirls’ Stories, The Empire Annual for Girls, The Empire Annual for Boys, Teddy Tail’s Annual, Thrills and Spills, Young People’s Own Annual, Girls’ Interests, The Girls’ Adventure Annual, The Schoolboys’ Story Book and The Boys’ Budget. 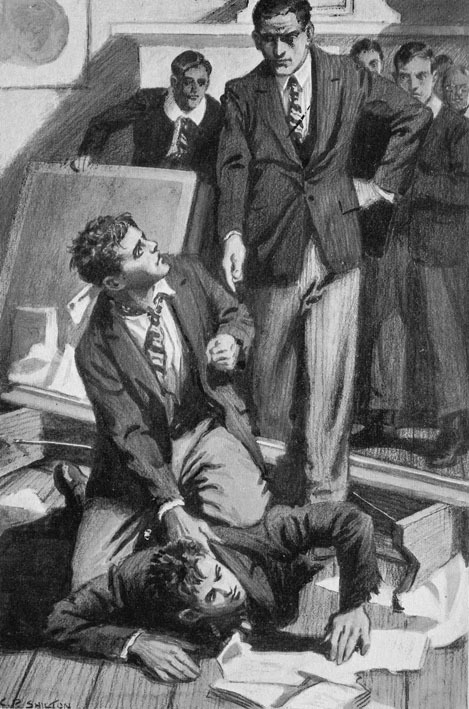 He also contributed to a variety of periodicals, including Young England, Modern Wonder, The Schoolgirls’ Weekly, The Red Magazine, The Detective Magazine, The New Magazine, The Bystander, and, most notably, Chums (between 1925 and 1940). 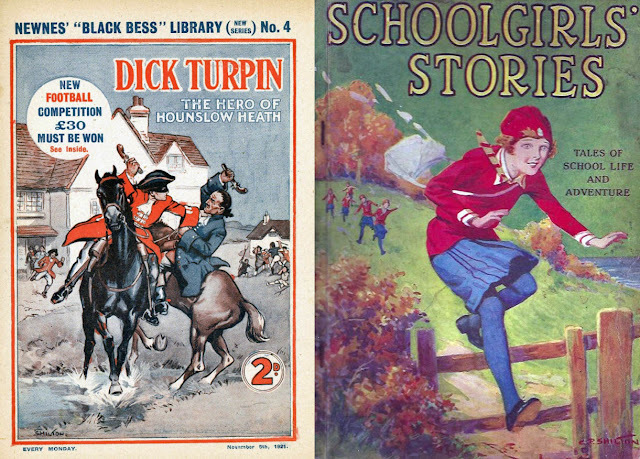 He also contributed covers to George Newnes’s Black Bess Library in the early 1920s. As a painter, in oils and watercolours, he specialized in landscapes, village scenes (both in the UK and abroad), and flowers – he did several paintings in Kew Gardens. Some of his paintings verged on the twee, being the sort of image commonly found on biscuit tins and chocolate boxes, but many others showed a real talent. 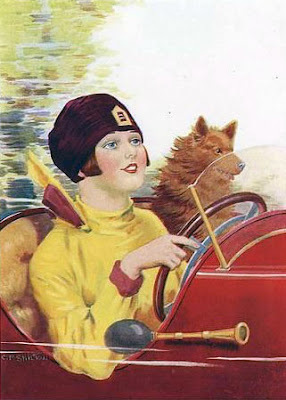 Little of his work as a designer has been identified – his best-known work, “The Girl at the Wheel”, appeared in a magazine in the 1930s, and has been widely reproduced. On 13 June 1939 Shilton enlisted in the 6th East Sussex Regiment, and a year later was transferred to the Queen’s Royal West Surrey Regiment, with whom he served as a Lieutenant until 1945, when he briefly joined the Pioneer Corps. 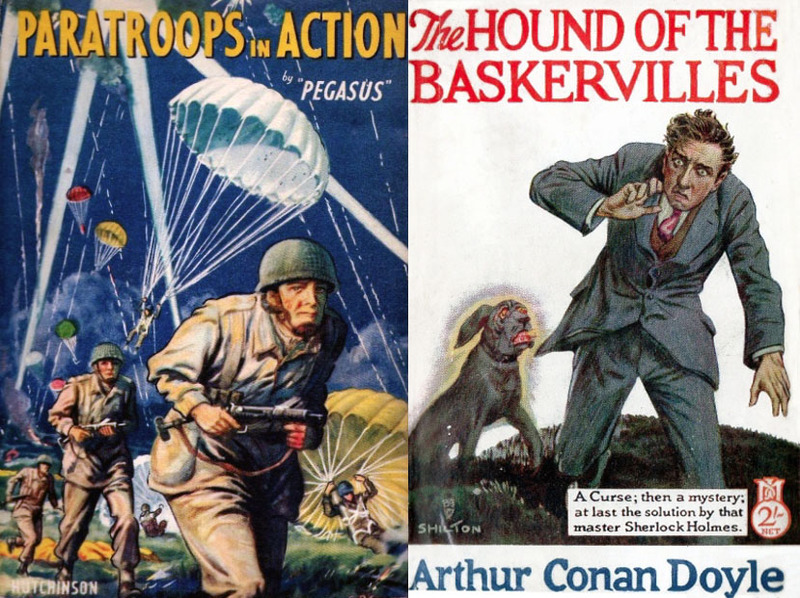 He continued his artistic career after the war, illustrating a few more books and also being used regularly by the Mellifont Press as a cover artist for their western and horse-racing paperback reprints in the 1940s, 50s and 60s. In the 1950s, he was a member of the Society of Fulham Artists. He died, of a cerebral haemorrhage and arteriosclerosis, on 15 May 1968 at 81 West Hall Road. His wife died in March 1976.